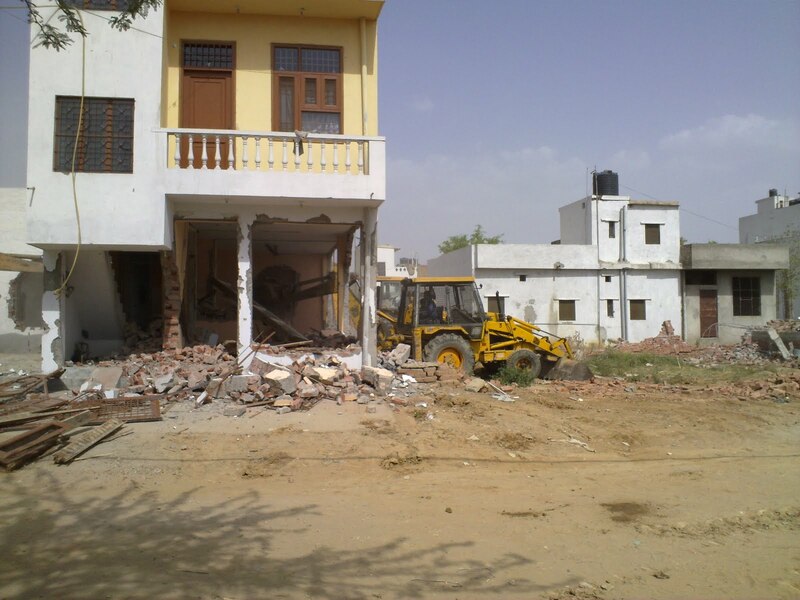 The matter pertains to the demolition of 500 plus cases of illegal constructions in the ‘Development Area’ situated in the area of Vasanth Kunj and Jaitpur, New Delhi. The illegal constructions have taken place after the cut off date given the Delhi (Special Provisions) Act, 2007 extended up to 31.12.2010. These illegal constructions have come up in the last 1 year period and have been booked under the relevant sections of Delhi Development Act for violation of Building bye laws and Master Plan provisions being situated under the Development Area. The competent authorities under the DD Act have passed orders after hearing the parties concerned and these orders have to be executed by demolishing the illegal constructions. It is surprising to note that few new unauthorized colonies have been recently built by the builders violating all laws. They have constructed multistory buildings and flats have been sold through open advertisement in the media. Against these large scale illegal constructions, there are a number of complaints have been received and complaints have also been sent to CVC, who have sought report in the matter. Further, the matter is also before the Hon. High Court of Delhi through a PIL and we have to submit action taken report before the Hon. High Court of Delhi. The ‘Development Area’ has been approved by the Authority for de-notification but formal notification has not yet been issued. However, whether the area is de-notified or not, the demolition orders under section 30 of DD Act are liable to be executed and DDA is duty bound enforce the law. As these are large scale demolition of illegal constructions, the matter was placed before the Hon. LG. and written approval of Hon. LG has been obtained. Moreover, Hon. Minister for Finance, GNCTD recently raised the issue of new unauthorized colonies mushrooming in the Delhi, for which Hon. LG has directed that action as per law should be taken without further delay. It is therefore submitted that DDA is undertaking demolition of constructions which have come up after the cut date of 07.02.2007 and which are not protected under the Delhi Laws (Special Provisions) Act, 2007 extended up to 2010. Also DDA is enforcing law in the newly curved out unauthorized colonies. Moreover, in most of the cases, the land has been acquired for DDA but due to the status quo orders passed by the Hon. High court/Supreme Court, the acquisition proceedings are sub-judice. However, the parties concerned have violated the status quo orders of courts as they have created third party interests and have totally changed the nature and character of land. Therefore, DDA has left with no other option than to enforce the law and to submit action taken reports before courts and vigilance authorities. It is clarified that DDA shall not demolish any structure existing in a unauthorized colony, which is protected by the Delhi Laws ( Special Provisions) Act, 2007 extended up to 2010. The demolition programe is being done under the supervision of Mr. H. Rajesh Prasad, Commissioner ( lands) DDA. Is every one Fair ? No Relief to Rahat ! The Humanity Excellence Award on 19th Nov.